Broad-spectrum tetracycline-class antibiotics, such as minocycline and doxycycline, are considered first-line therapy in the management of moderate to severe acne.1 In addition to their antimicrobial activity, tetracycline-class antibiotics have anti-inflammatory properties.2 However, currently available agents may be associated with gastrointestinal (GI) side effects, including nausea, diarrhea, and vomiting; other potential side effects include skin photosensitivity with doxycycline and vestibular events (eg, dizziness, vertigo) with minocycline.1,3 Additionally, given their broad spectrum of antibacterial activity, oral tetracycline therapies for acne may negatively impact the microbiome, potentially leading to antimicrobial resistance, which may limit the efficacy of tetracycline antibiotics for the treatment of infectious diseases and, more broadly, promote multidrug resistant bacteria.3-8 These limitations demonstrate a need for tetracycline-class antibiotics for acne with improved safety profiles and a targeted, narrow spectrum of antibacterial activity.1,3 Sarecycline is a once-daily, novel, tetracycline-class antibiotic for the treatment of moderate to severe acne. Sarecycline has a narrow antibacterial spectrum with limited activity against enteric gram-negative bacteria compared with minocycline, doxycycline, and tetracycline, which may confer less disruption of the GI microbiome at doses recommended for acne treatment. 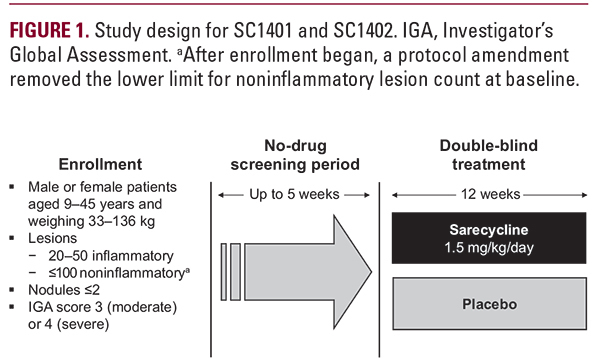 A 12-week, phase 2, dose-ranging trial demonstrated that sarecycline 1.5 mg/kg/day is well tolerated, safe, and effective in patients 12 to 45 years of age with moderate to severe facial acne.9 This report describes the results of 2 identically designed, phase 3 pivotal trials, SC1401 and SC1402, to evaluate the efficacy and safety of once-daily sarecycline 1.5 mg/kg for 12 weeks in patients aged 9 to 45 years with moderate to severe facial acne vulgaris. Study Design Two identically designed, randomized, double-blind, placebo-controlled, parallel-group, phase 3 studies (Figure 1) were conducted in the United States: study SC1401 (Clinicaltrials.gov identifier NCT02320149), conducted at 56 centers, and study SC1402 (NCT02322866), conducted at 54 centers. After screening and baseline assessments, study visits occurred at weeks 3, 6, 9, and 12 of treatment.The studies were conducted in compliance with Good Clinical Practice guidelines and approved by an Institutional Review Board. All patients provided written informed consent or assent.Patients Eligible patients were aged 9 to 45 years, weighed 33 to 136 kg, and had 20 to 50 inflammatory lesions, ≤100 noninflammatory lesions, ≤2 nodules, and a score of 3 (moderate) or 4 (severe) on the Investigator’s Global Assessment (IGA) scale for inflammatory lesions of acne.Individuals were excluded from the studies if they had a dermatologic condition or facial hair, any chronic illness interfering with study evaluations, allergy or resistance to tetracyclines, drug-induced acne, hormonal contraceptive initiation, systemic retinoids, systemic corticosteroids, androgens, or anti-androgens within 12 weeks prior to randomization.All randomized patients composed the intent-to-treat (ITT) populations.